Whether you are a couple getting married with your own children there or are thinking of inviting your guests children to you wedding. There are lots of ways to get the best out of your day and make it a fun place for children too. If planned then children at weddings won’t be disrupting and they won’t get bored in the process. Then its more likely that things should run smoothly for everyone involved. Get them involved otherwise it can be boring for children at weddings! It’s lovely to have small children as bridesmaids or pageboys. They can give an extra element to your day as you never quite know how they will act. Lots of fun to be had and they also look very cute in pictures. Our real bride Jemma had her gorgeous children involved and took some fun photographs too. 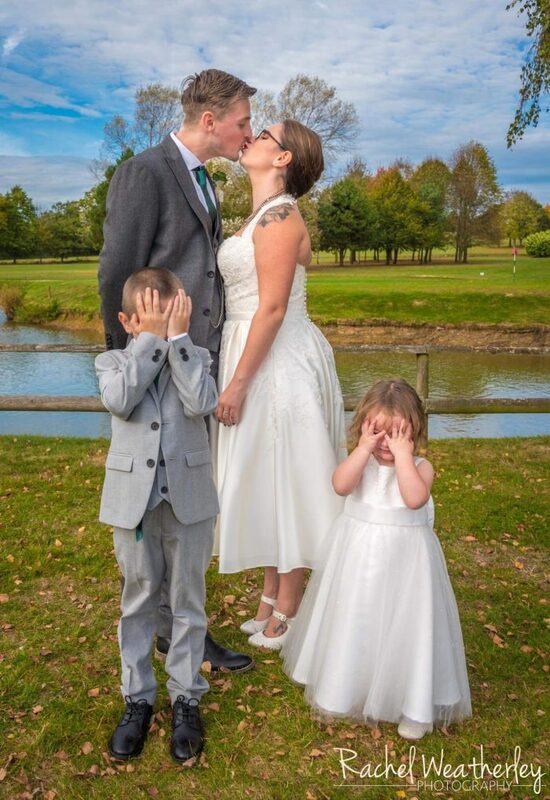 She wore Eliza by Timeless Chic which is a stunning halter neck tea length wedding dress. It is a calf length, satin and lace vintage 1950s inspired wedding dress with halter-neck. A wedding for small children is like one big adventure playground so it’s a good idea to have something for them to do. Some couples opt for an entertainer on site to give parents a bit of a break too. You can keep it simple by adding some games for them to play during the lull in proceedings especially if you have some outside areas for them to run around in. Table favours are also a great idea because children can get bored during speeches and formalities. Fun things like plasticine or colouring to keep them busy and quiet passes the time for them too. A dressing up box of clothes and a disposable camera can make for some fun memories – this is also something the adults will get involved in too, the photographs will be priceless! Lots of venues offer child friendly options on their menu’s as some children can be fussy. Or at the buffet incorporate things that little people might find fun to eat or try. Another way to get their eyes lighting up would be a sweet table and lots of companies provide sweet carts all set up and ready to go. Or a little treasure hunt on the day could result in a prize of some snacks to reward their efforts. Lots of music and mayhem can be overwhelming for some children. So maybe have an option of a quiet area that children can retreat to. This is also great for any tiny children who need a daytime nap or go to bed before the reception really kicks in. This gives parents the option of staying later if they know their little one is sleeping soundly nearby. Equally although it’s fun to have children at your wedding for some it’s just not an option. It’s not easy to always accommodate the extra costs involved if your budget is already tight. So don’t worry but do let people know on the invite – as sometimes other take it for granted they are invited. Not everyone has children at weddings so it’s totally your choice. 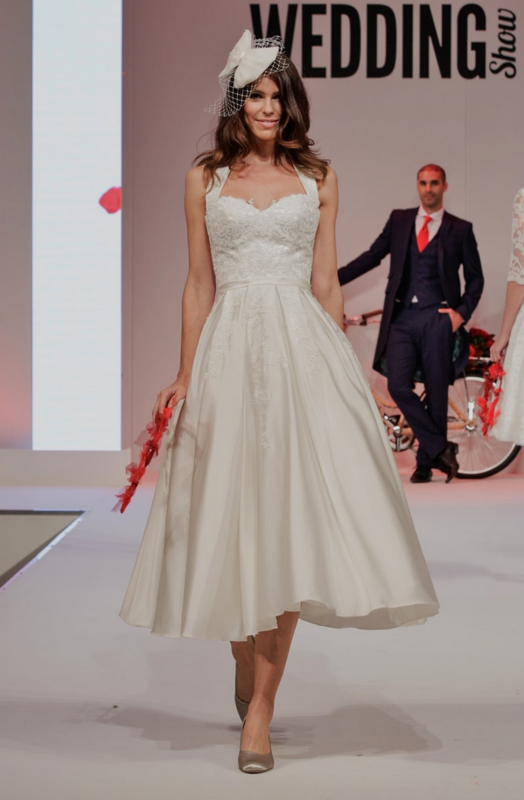 We have over 150 designer vintage style wedding dresses in our Bexley boutique. If you would like to find your perfect tea length wedding dress contact us today. Book in your one to one appointment where no other brides will be present. You can then try as many dresses as you like to find the style that suits you.